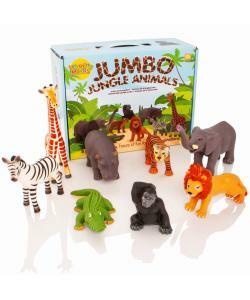 Includes 8 highly detailed jumbo jungle animals for fun pretend play. Perfectly sized for little hands, each piece has been hand painted to look very realistic. 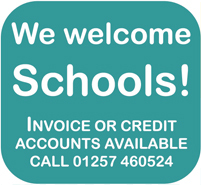 Made from durable, high quality vinyl. Softer than standard plastic figures for extra safety. Includes a gorilla, crocodile, elephant, giraffe, hippo, lion, tiger and zebra. 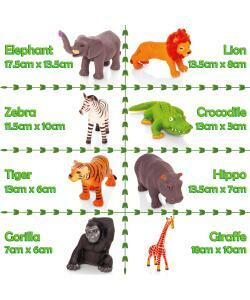 The largest figures are the giraffe and elephant at 18cm x 12cm approx. 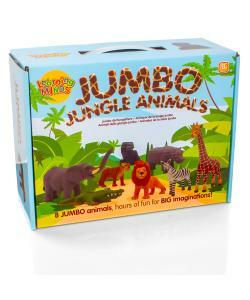 Jumbo animals come in a handy storage box with carry handle. 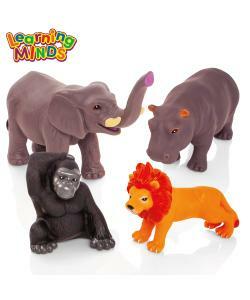 Learning Minds Jumbo Jungle Animal are chunky sized wild animals that encourage imaginative play among little explorers! 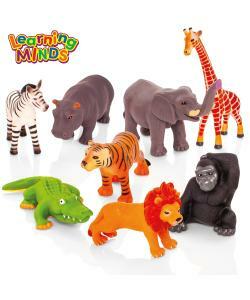 This set of eight includes one each of a gorilla, crocodile, elephant, giraffe, hippo, lion, tiger and zebra. 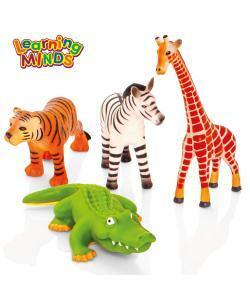 The jumbo size of these pretend jungle animals make them perfect for small hands. The set comes in a handy box which is perfect for storage. Suitable for ages 18 months+.